Western Bottle News: A rare Surprise. 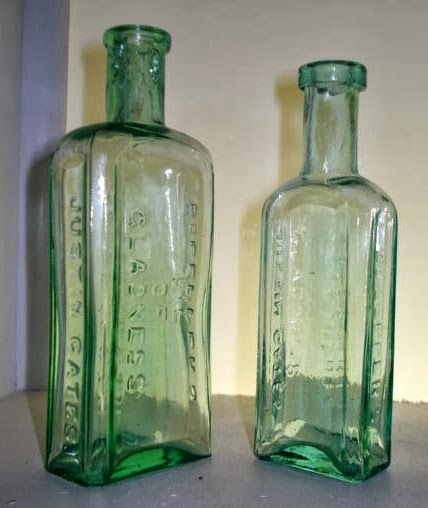 Recently I threw a minimum bid in on a nice early Sacramento applied top medicine. The description was vague at best and minor details such as condition and actual size were not in the description at all...only a few pictures. When the bottle arrived, I was pleasantly surprised to find a mint condition LARGE size Dr. Lepper's Oil of Gladness, Sacramento. The smaller sized examples are scarce early meds, but I have only seen a couple of the large "economy size" variants. This one is crude and full of micro bubbles with a large applied top. While the majority of my acquisitions of vaguely described glass leaves me disappointed or requesting a refund, this was a nice surprise in a good way.I am full of "gladness". The large size is 5 1/2" and the small 5" Both have applied tops. Thanks for the pic of your Oil of Gladness examples Rick. Your large sized specimen which you got from me, and my recent acquisition are the only two of these I have ever seen. I believe there are maybe 6 known in this large size, and about 20-25 of the small size in collections. 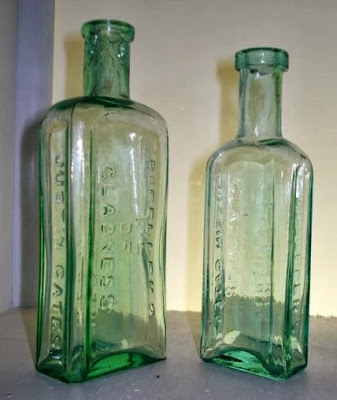 These are some of the earliest Sacramento meds dating from the late 1860s through the mid 1870s at the latest. I believe GP dug one in color, but I have not seen it.. Dale M.
Flickr or Fb? The query is, do carriers shed money on these deals. EVERNOTE (Free)Make your Android gadget an extension of your mind. Tango is one hell of an extraordinary app.